Essays about bird dogs typically don't begin that way. It's more common to read about a chiseled, muscular, and sinewy English pointer carving up a quail field until it locks up on point reminiscent of a stone statue. It's standard-operating-procedure to hear about the stately and gentlemanly English setter standing tall with a high head and a high tail. Naturally that setter dog has a big chest and shoulders, small hindquarters, and tail and leg feathers that undulate in the wind. Those portraits and others like them have appeared in countless books and essays for decades because they are true. Albert the Westie distinguished himself has both a flushing dog and a retriever. He was particularly fond of quail and Huns (photo: Gordon Allen). On a National level there are more pointers and setters in bird doggers' kennels than possibly any other breed. Add to it the fact that 2017 marked the 26th consecutive year that the Labrador retriever has been America's top breed. 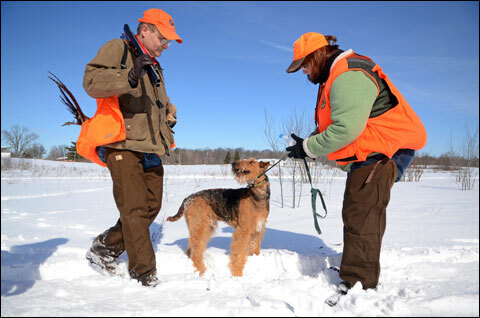 Visit Pheasants Forever's National Pheasant Fest and Quail Classic's Bird Dog Parade and you'll see shorthairs, wirehairs, Munsterlanders and just about any kind of pointing, flushing and retrieving dog used for hunting. After you see that kind of diversity think about these three honest dogs bred for purposes other than upland bird hunting and waterfowling. They have so much hunt in 'em that they put on a show. And because of their size and demeanor they do that in spades. 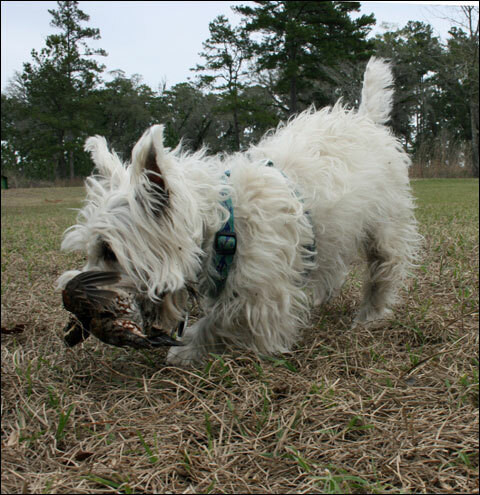 Gordon's first Westie was named Albert. "Albert cut his teeth on Saskatchewan Huns and sharptails, both of which he flushed and retrieved to hand. He took his job so seriously that I decided to take him waterfowling. He was excited as any lab I've owned, and was tenacious when retrieving downed geese. Next I took him quail hunting in Thomasville, Georgia. Albert was our flushing dog and did an excellent job retrieving. He loved sitting in my saddle while I rode a Walking horse towards a point, and because he was bold Albert had no fear of mules or wagon wheels. I'm on my second Westie, a female named Radar. So far she's showing a lot of promise, and I've even had her out for woodcock." A few weeks ago I was chatting with my friend Kayla Miller who works for Purina. In the course of a year she sees a lot of dogs. Back in 2015 she wrote a terrific piece about Dale & Kim Burrier of Airecraft Airedalesin Newton Falls, Ohio. The Burrier's have been breeding, training, trialing and hunting their Airedales for over 30 years. As it was six degrees outside I stayed by the fireplace and gave Dale a call. Dale and Kim Burrier love hunting pheasant and waterfowl with their Airedales (photo: Purina). "I grew up hunting over Brits," he said. "My father had a shorthair, but most of my hunting was over Brittney's. Like most kids I didn't hunt much in college, but that changed when I graduated. I got married and got my first Airedale in the early 1980's. My wife Kim previously had owned Airedales, so ours was a natural fit. We ran AKC test through the '80's and the hunting evolved shortly thereafter. “Because of their ability to flush upland birds, retrieve waterfowl and track game, Airedales are distinguished as three-in-one gundogs. They’re part spaniel, part retriever and all terrier. They have deep chests, tremendous lung capacity, and are well balanced which enables them to run all day. A double coat of interior guard hairs combined with a hard, wiry jacket keeps them insulated from both warm and cold temperatures. They're protected equally well from icy water in a duck marsh and the briars and thorns of an upland covert. Web feet makes them powerful swimmers in big water, and they run silent with no baying. They're good flushing dogs and work within a 20-40 yard range. We hunt Chesapeake Bay sea ducks and Snake River Valley pheasants and waterfowl. Airedales are one dog for all purposes." 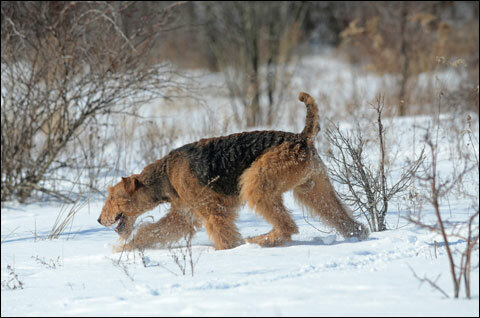 Airedales have double coats which keep them warm in the winter and cool in the summer. It keeps the briars and thorns at bay (photo: Purina). Alex Brittingham is a professional trainer in Southeast, Texas. While her professional focus is on her kennel full of Labs, she devotes some of her personal attention to Jack Russell terriers. "My family has always had Jack Russells," she said. "We really love the breed and they fit well with our lifestyle. I think most people don't consider them as suitable retrievers because their primary purpose was to bolt foxes from their lairs. Given a chance they'll retrieve eagerly and willingly. 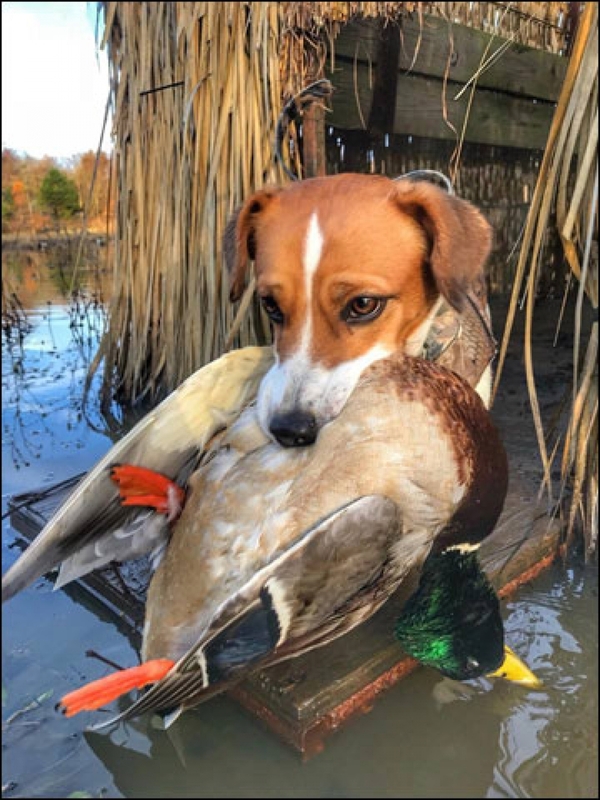 Alex Brittingham’s Jack Russel named Gator retrieves doves, ducks, and geese equally well on land and from the water. 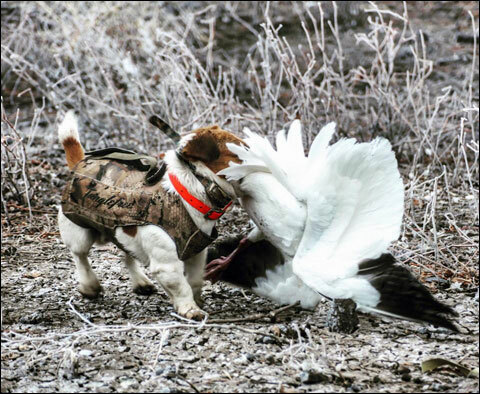 And when a dog retrieves a bird nearly his own weight you can't help but smile (photo: Alex Brittingham). "A few years ago my dad and I shared custody of a dog named Moose. Moose was an outstanding retriever for a variety of birds ranging from dove to ducks and geese. Moose inspired me to work more formally with my current Jack named Gator. "I train Gator exactly as I'd train a Lab, and his drive and desire is intense. He's fun to train and great to bring on a hunt. Gator is 11 inches tall, and when I'm in a pit blind I can see how close he is to the ground. I can't help but wonder how he can mark his birds. He's always spot on, and I suspect that what he may miss in sight he makes up for in drive. Gator doesn't return from a retrieve without a bird." Alex Brittingham's Gator is 18 pounds of duck retrieving terrier (photo: Alex Brittingham). "It's not the size of the dog in the fight it's the size of the fight in the dog," goes the adage. While these breeds might not be the first ones to come to mind for upland and waterfowl hunting, they have earned their place in the rotation. My hat is off to them, and to their owners/handlers, as well.